Includes the coaches social (Free) & Lunch on Saturday and Sunday. Stuart Neely has worked for both Toronto FC and the Vancouver Whitecaps in the past. He served as Toronto FC’s academy director, head coach of the senior academy team and assistant coach of its USL club. In Vancouver, he was the Whitecaps’ head of player management and advancement. Neely has also worked with Ontario Soccer, Manitoba Soccer Association and B.C.’s South Delta United. He coached the University of Toronto women’s team, worked with England’s Bradford City and Belgium’s RRFC Montegnee and served as head of football development with New Zealand Football. 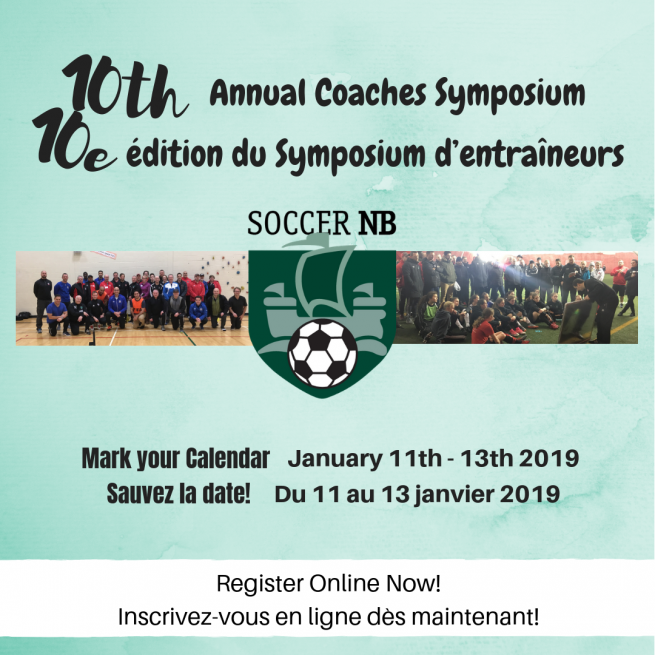 He previously was Canada Soccer’s technical programs manager and has been a master coach developer on Canada Soccer Licensing programs for the past 15 years. Ray Clark played as professional Soccer players in England before moving to Canada. He also served as head coach when Ontario won gold at the 1989 Canada Games Men’s Soccer Tournament. Ray served as Director of Coaching for the Canadian Soccer Association (he joined 29 April 1992) and has served as a staff coach in Canada Soccer’s men’s national youth program, on Canada’s coaching staff at the FIFA Confederations Cup Japan 2001, served on Canada’s coaching staff at the 2007 CONCACAF Men’s Under-17 Qualification Tournament . 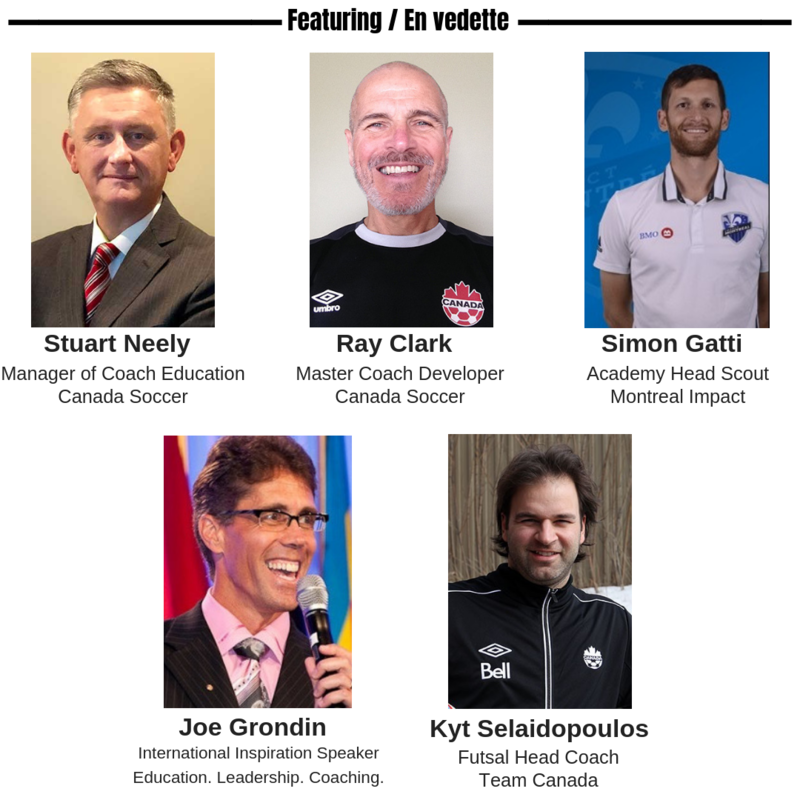 He has been a master coach developer on Canada Soccer Licensing programs for the past 25 years and is the main instructor of Canada Soccer A licence and B licence program. He reached his 100th career game start with the impact and received the Unsung Hero Award/Quatrième étoile de l’Impact for the second time in his career. His final statistics with the Montreal Impact include 122 games played, 100 game starts and 8,656 minutes played. Gatti announced his retirement in February 2012 and was subsequently hired by the Montreal Impact Academy to coach the U-14 team as part of the Montreal Impact Sport-Études program. He also served as the assistant coach of the USL Pro Team Montreal FC. Joe Grondin is a 2x World Championship of Public Speaking Finalist, Toastmasters Accredited Speaker, International Inspirational Speaker, Author, and Speech Coach. He has been a teacher/administrator since 1983 and has a Master’s Degree in Teaching & Administration, and a Principal’s certificate. He has taught every single school grade level (K-12), and worked for several years with “At-Risk” youth. Joe was the Science & Physical Education Subject Coordinator in the last 3 years before his retirement, and honored with the Garth Wade Career Award for Physical Education at his retirement. He is the author of the book, “Living in Harmony With Our Children,” and a keynote speaker who advocates on their behalf. Joe cherishes speaking opportunities that target Education, Leadership, Wellness, and Public Speaking. Kyriakos (Kyt) Selaidopoulos has been appointed Canada Soccer’s National Futsal Coach for the upcoming cycle of CONCACAF and FIFA competitions. Coach Selaidopoulos will lead the program for both the CONCACAF Futsal Championship and the FIFA Futsal World Cup Colombia 2016.Selaidopoulos has recently served as provincial team coach for the Federation of Soccer in Québec. He has a FIFA Futsal Level 1 coaching certificate (2011) as well as his Canada Soccer Coaching B Licence (2014). He has also served as Technical Director for CS Mont-Royal Outremont. Kyt played for Montreal Impact. During the 2004 season he assisted in the team’s record 12-game undefeated streak, and won the A-League title, the club’s second North American Championship in team history. He would return to indoor soccer by signing with the Cleveland Force of the Major Indoor Soccer League in the winter of 2004. He would have stints with Milwaukee Wave, and the Detroit Ignition.